The lack of control over the uniformity of moisture content is a leading cause of problems experienced by industry in effective compaction control of earth fill materials. Current measurement techniques for determination of moisture content generally involve spot tests that can be time consuming, unreliable and do not provide adequate coverage. 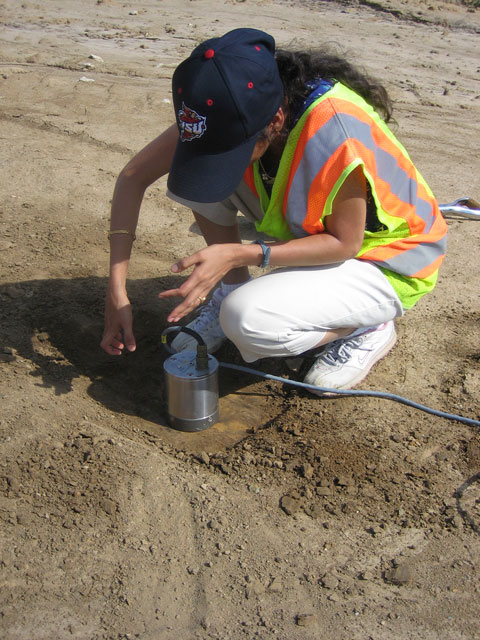 Recent advances in non-destructive evaluation technologies, especially near infrared reflectance spectroscopy (NIRS), and data analysis techniques (e.g., multivariate analysis and Bayesian statistics) show significant promise in obtaining necessary information that could significantly advance field moisture control for earthwork construction by increasing the coverage area in lieu of spot tests, providing measurements that are accurage, and speeding up the inspection process and providing real-time results in computer format. Research is needed to identify suitable technologies, evaluate them for robustness and accuracy in a wide range of soil types; develop data analysis and output algorithms and create onboard machine equipment; and launch technology.